I fell under cricket’s spell from an early age, and I cannot recall a time when the game was not important to me. As a child most summer Saturdays would be spent watching my father play for the local village team, and when he wasn’ t doing that I would bombard him with all sorts of cricketing questions, most of them put in my head by poring over his collection of post war Wisdens. I particularly liked the records section of the Almanack, and my favourite table of all was that of batsmen who had scored at least 35 First Class centuries. As an aside it is disappointing, if inevitable given the constraints on the editor, that the criteria for appearance in the list has now increased to 50. Under the old regime the former Kent player Bryan Valentine clung tenaciously to last place, on alphabetical order, from CS Dempster and DR Jardine plus whichever other men might be reposing with them pending their elevation in a future edition. I knew a bit about Valentine because his career continued for a few years after the war, so I had a record of some of his deeds, and he somehow therefore seemed real. Dempster figured briefly in the 1947 edition of the good book, but was a New Zealander something which, I am ashamed now to say, for some reason in those days made him seem rather less significant than he actually was. But Jardine was a mystery. I knew he had played Test cricket, Wisden confirming he had as many as 22 appearances for England. I knew too, from the renowned “Births and Deaths of Cricketers” section, that he had died at the relatively early age of 57 in 1958, but irritatingly my father’s collection lacked the 1959 edition, so I had no access to his obituary. Thus I knew next to nothing about the man behind the name I read so often. I asked my father more than once about Jardine, and not getting much response from him I asked his teammates as well. It wasn’t that they didn’t want to tell me but they were all, Dad included, a bit too young to know – the word “Bodyline” was mentioned occasionally, and I learned the names Larwood and Voce, and that they were fast bowlers, but not a lot more. All three, but Jardine especially, seemed forgotten, even lost. I never lost my fascination for the game and its history, but as I entered my teens other things became important and the desire for knowledge about cricket’s past generally, and DR Jardine in particular, faded. Then one evening in 1983 I was fortunate after a few beers to catch a poorly advertised 50th anniversary documentary on BBC2 about the 1932/33 tour. Even now, almost 30 years on, I have never been able to work out the best superlative for the programme. It brilliantly told the story of Bodyline through archive footage and interviews. Bob Wyatt, Bill Bowes, Gubby Allen and Les Ames appeared from the English victors, and there was an evocative interview with Larwood conducted by Fred Trueman. From the Australian side viewers heard from Tiger O’Reilly, Jack Fingleton, Len Darling and Bull Alexander. My imagination fired I went out the next day and bought a copy of a new paperback edition of The Larwood Story, the 1965 autobiography of the Notts Express. I now have 24 books on the series and have read them all. Of the 17 England tourists there have been biographies or autobiographies published in respect of all but three of them. There have been fewer offerings by or in respect of the Australian players, and those there have been understandably dwelt rather less on Bodyline and Jardine, but there are still several around. While there are inevitably contradictions in the various accounts, for anyone who has the time and the patience to acquire a decent cross-section of the books it is easy now to get a fully rounded picture of Douglas Jardine. It is not my purpose in writing this feature to set out at any length the details of Jardine’s cricket career but just a few statistics are needed to put him in context. He was an essentially defensive batsman, and while he was not quite touched by greatness he was by all accounts a very fine player. His First Class average was almost 47, and his Test average exactly 48. He did not score heavily in 1932/33, averaging just 22, suggesting perhaps that inwardly if not outwardly the pressure affected him just a little. He recorded 10 fifties in his 22 Tests (four in Australia) with just one century, albeit a notable one, 127 at Old Trafford in 1933 against the West Indies, an innings of which his vice-captain in Australia, Bob Wyatt, said Outstanding against this attack was Jardine. It was fascinating to watch how the England Captain, who had been so much criticised using these tactics in Australia, played this fast leg theory. Martindale and Constantine directed their attack against him with unflagging zeal, but Jardine showed that this type of bowling could be played without suffering injury if the batsman had sufficient nerve to stand up to it. The following winter Jardine captained England in India, and the MCC had to deal with the delicate question of who should be appointed to lead against Australia in 1934. It was, potentially, a hugely problematic issue but one which, ultimately, they did not have to make a decision on as at the end of March Jardine declared himself unavailable. He spent that Ashes summer reporting on the series for a newspaper. He was just 33 and never played “big” cricket again. I shall also touch briefly on the status of cricketers and administrators in Jardine’s time. In England the long standing distinction between amateurs and professionals remained at the heart of the game. In a nation that still had a deeply entrenched class system the amateur gentlemen were treated very differently from the professional players. They often had separate dressing rooms, would frequently stay at better hotels and on some grounds even took different routes on to the pitch. Professionals had to refer to amateurs as Mr, and captains and administrators almost always came from the amateur ranks. Australia was a much more egalitarian country and in reality there were no such distinctions between the players, although the game’s moral guardians took the view that, as none of them derived their livings directly from the game, they were therefore amateurs. The England party contained four other amateurs in addition to Jardine those being Wyatt, future captains Gubby Allen and Freddie Brown and the Nawab of Pataudi. English cricket was a field of endeavour where, between the wars, professionals had to tug their forelocks in the direction of the amateurs and men who didn’t, like Charlie Parker of Gloucestershire, found their careers blighted as a result. There was often a degree of resentment bubbling not too far under the surface, as many professionals resented the power enjoyed by those who they saw, usually quite correctly, as having lesser ability, knowledge and experience of the game than they did. So what did Jardine’s men think of him? Harold Larwood, whose admiration for his “skipper” never dimmed wrote in 1965 Patrician, aloof and irritating this Oxford-educated lawyer and upper class Englishman might have been, but without his strength of character there would have been no Bodyline. It could not have survived the pressure. In that respect it would not be unrealistic to regard the amateur Jardine as the first cricketer who was fully professional in that he went on to the field with one thing in mind – to win. Walter Hammond, a solitary figure not given to extravagantly praising anyone, said after the Second World War Anyone who has ever played in a team with Douglas Jardine has been struck by his imperturbability, his calmness when things go wrong and his cold determination to win, neither giving or seeking quarter.When commenting on the respective merits of amateur and professional captains generally he added The best captains under whom I served were amateurs – Jardine was perhaps the most effective of them all, and, in my opinion, one of the finest Test captains of any country in my time or since, and of the man himself he commented Jardine treats everyone, Australians and his own team, distinguished patrons of the game and autograph hunters, in exactly the same way. Had Jardine been an insufferable snob, as Australians often did, and not infrequently still do, portray him then the Yorkshire contingent in the party, and Yorkshiremen generally, would have seen through him in an instant. Herbert Sutcliffe, writing in 1935 said I have never played under a better tactician than Jardine, and I have never played under a better fighter, he was a wonderful source of inspiration to us all., and Bill Bowes, by then a pressman, said after news of Jardine’s death was announced To me and every member of the 1932-33 MCC side in Australia, Douglas Jardine was the greatest captain England ever had. A great fighter, a grand friend and an unforgiving enemy. The other Yorkshireman in the party, left arm spinner Hedley Verity, admired Jardine so much he named his son after him. The feeling was mutual Jardine, after the party returned, taking the trouble to write in a letter to Verity’s father On and off the field Hedley has been a real friend and a grand help to me – you must be a very proud father and with very good reason. They were different times of course, but I cannot imagine that many Test match captains have ever done the same or similar. And I mentioned Yorkshireman generally. Jardine played against them for his county, Surrey, at Bramall Lane, Sheffield in July 1933. Sutcliffe described what must have been a moving moment for him; He had a welcome exceeding anything I have known to be given to a Yorkshire player there. The crowd stood to cheer and show what Yorkshiremen thought about the way in which he had fought in Australia….he halted halfway to the wicket and turned to sweep his Harlequin cap in acknowledgment of the honour paid him. Some men, when greeted with such an emotional reception, might then get out for a duck, and miss out on a momentous landmark. Not Jardine. In the first innings he helped avert complete disaster for his side, and in the second, playing almost a lone hand against Verity and Bowes at their best, he scored what was to be his last century for Surrey. From across the Pennines came Eddie Paynter who, in his 1962 autobiography wrote One man must take more credit than any other for the regaining of the Ashes. That man was Jardine, our captain who, by his astute tactics and personal example on the field, proved to be a model leader – he had gone to Australia with an insatiable desire to return to England as guardian of the Ashes. This desire he expressed again and again in the bitterest of terms until every member of the touring party contracted his lustful complaint. Wicketkeeper Ames was Jardine’s preferred option to keep an eye on Larwood and Bill Voce in order to ensure that they did not over-imbibe. I suspect he was rather better at keeping wicket to the Notts pair than nursing them through nights out, but he clearly didn’t resent the task and wrote of Jardine He was a bit of a loner. He was never a man to let his hair down and have a few drinks. I never knew what his innermost thoughts were. He was a difficult man to understand but when I met him again after the war he had mellowed and was charming company. It seems that his one ambition, and no-one could fault him for that, was to win the Ashes. So much for the professionals. Were the amateurs as solidly behind their captain? Wyatt certainly was although, given his appointment as vice-captain that is hardly surprising. In 1951 he wrote We had a great captain in Jardine. He used his bowlers magnificently and was a splendid example to us on the field. He had a minute knowledge of tactics and strategy and knew exactly what he was up to. 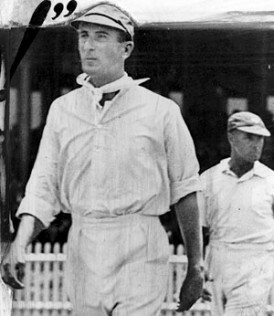 Brown, who at just 22 was the youngest member of the party, did not get a look-in in the Tests but had a long career, more than half his 22 Test caps coming after his 40th birthday, and many of those as an old-fashioned autocratic captain. He published his memoirs in 1954 and wrote of Jardine I always considered him a very astute captain. His knowledge of the game was profound, he knew what he wanted, and he surely got it. He was ruthless and quite fearless of the consequences; he never asked any of his men to do something he would not do himself. Pataudi, the Indian prince, was just a few months older than Brown but he did get a place in the first Test when, on debut, he ground out 102 in five and a half hours. He wasn’t selected again and while he never spoke out openly against Jardine he clearly did not relish his captain’s tactics. It is well known also that Allen and Jardine fell out, although the extent to which Allen’s motivation was purely his disdain for the tactics, or alternatively due to concerns over his own popularity and reputation in the land of his birth, has exercised the minds of several authors. What is certain is that in one letter home during the series he wrote He is difficult and whines away if he doesn’t have everything he wants. We all try very hard with him but I know as time draws on that someone will have the very devil of a row with him. It won’t be me so don’t worry, but sometimes I feel I should like to kill him and today is one of those days. In 2005 a small book appeared that looked closely at the correspondence Allen sent home during the tour – the content of his letters does not enhance Gubby’s reputation. With that one isolated exception Jardine seems to have inspired huge respect, admiration, loyalty and even affection amongst his team, which surely must say very much more about Jardine than it does about the exception. And just to demonstrate that that appeal was not just inspired by nationalism, the one truly famous contemporary cricketer from outside England and Australia, Learie Constantine, weighed in after the war when he wrote Personally I consider Jardine the most formidable Test captain I have ever seen, and perhaps of all cricket history up to now. But for completeness I should also look at the views of the Australians. O’Reilly described Jardine as an unrelenting competitor and Vic Richardson wrote that he was ruthless and inflexible. In the 1983 documentary Alexander said I hit him a few times at Sydney. He had blood coming out of his glove but he never flinched – he had a ton of it – what it takes, so it is clear that there was respect there if no fondness. That said in time O’Reilly, who often shared a press box with him after the war, found Jardine an affable companion and Fingleton, who suffered as much as any Australian batsman from blows about the body, and who facilitated Harold Larwood’s emigration to Australia, certainly became firm friends with Jardine as well. Perhaps the fact that neither O’Reilly or Fingleton cared for Bradman is a factor here but, if it was, I suspect it was a very minor one, and it should not be forgotten that it was Fingleton who said, when interviewed about the Bodyline tour in 1977, I think, looking back, the Australians perhaps made too much fuss about it. And what of the Don? After Bodyline he and Larwood were never at ease in each other’s company and it was no different with Jardine. That Jardine had enormous respect for Bradman’s batting is a given, after all Bodyline was devised for the sole purpose of keeping him in check, but the saga’s two leading characters never made peace. Jardine never wrote an autobiography although in 1933 his defence of Bodyline, In Quest of the Ashes gave his account of the tour and the justification for his tactics. Bradman did publish an autobiography, Farewell to Cricket, in 1950 in the course of which he took issue with Jardine’s reasoning, but pointedly expressed no opinion at all about the man himself, and mentioned his name only when he had to. Jardine reviewed the book and summed up; A good deal of its interest lies in what the writer might have said and did not say. Three years later, at the Headingley Test, someone decided to sit the two old adversaries next to one another in the press box. They bade each other good morning and good night. The measure of the depth of the scars each had inflicted on the other in 1932/33 is that those formal greetings apart not a word passed between them. That it took fifty years for Douglas Jardine’s reputation to be rehabilitated in England is remarkable. Perhaps equally unexpected is the manner in which interest in him, his men, and that famous series of Test matches has endured ever since. In the unlikely event that Wisden ever reverts to its old criteria for inclusion in its list of centurions, it can be said with certainty that no wide-eyed young cricket lover gazing intently at the names on the bottom of that list will ever again need to wonder for very long just who Douglas Jardine was. Good to hear both sides of the story but my mind is made up about Jardine. This is a wonderful article – and a lovely piece of writing too. It captures both the essence of the man and his captaincy and also explains why he inspired such loyalty. He cared about those who served under him. Perhaps it will inspire the BBC to repeat the documentary. Well done. Great piece. Shows the esteem DRJ was held in by his own charges and opposition alike. It’s because of men like Jardine that makes one somehow believe it was possible this tiny island once administered a quarter of the globe. Martin, the three features you’ve posted consecutively represent a hat-trick of a quality which any Test would be proud of – fantastic stuff! I have always had a sneaking suspicion that what Fingleto said was ‘true enough’. Of course it was a shock to the aussie system to get two 145 km (guesstimate)fast bowlers operating for longish spells (unknown in Aust at that time) and bowling lots of bumpers. Prety much what WI (without the field placings) did in 1980’s. Somebody (maybe Hele) said it was interesting that each of the Aust. batsmen could make 1 significant score in the series but couldn’t repeat it (except Bradman to a degree).